Exhibitions devoted to the giants of English landscape painting in the 19th century seem to be like buses. You wait years for one to come along, then two arrive at once. Last week, it was Late Turner lashing us with his storms at Tate Britain. This week, Constable takes to the riverbanks at the V&A in a show with a powerful English presence. The V&A exhibition is an overview of Constable’s entire career, so it has a very different arc from the Tate’s Late Turner. There, we are confronted from the off by an artist who is fully formed. Here, we watch one becoming what he became. And, to be honest, it is initially a rather hard watch. The problem is that Constable took a long time to become Constable. He was born — in Suffolk, in 1776 — with two significant disadvantages. The first was a shortage of natural talent. The opening rooms here witness a considerable struggle. Constable wasn’t one of those fortunate artists who can draw fluently by the time they are six. In his case, the fluency didn’t really begin to appear until he was 36. His other disadvantage was his origins. His father, Golding Constable, was a wealthy corn merchant who owned mills in Flatford and Dedham. Where the lucky artists, the Holbeins, the Picassos, are taught art by their artist fathers, Constable was brought up to run a mill and transport corn to London. His decision, in his early twenties, to turn to art instead condemned him to two decades of difficult retraining. Those are the decades this show is initially about. It’s a hard watch because he really wasn’t much good at this being-a-painter lark. In the first room, we see him encountering the old masters who served as his mentors, trying to reproduce their effects with grim results. A beautiful Gainsborough woodland makes immediately clear why Constable admired Gainsborough’s landscapes and wished so determinedly to echo them. Unfortunately, the next painting is his own response: a confused and unconvincing melange of leaf and tree effects. Gainsborough had it in his fingers. Constable didn’t. It gets worse. He also admired Rubens, and particularly that gorgeous nocturnal landscape with the stars that usually hangs in the Courtauld. Rubens was one of the most fluent painters there has ever been: the very definition of a natural genius. Seeing Constable’s clunky attempt to paint a nocturnal landscape hanging next to the great Rubens original is embarrassing. He tries to emulate Ruysdael. And fails. He goes head to head with Claude. And fails. On and on goes the tuition, until the doggedness with which he keeps turning to the old masters for guidance begins, finally, to feel impressive. All this is unexpected. Constable is always thought of as a truth-to-nature painter: an artist who learnt how to paint the skies from the skies themselves. The V&A owns an enormous stash of hundreds of his cloud sketches, all done outdoors. Thankfully, this show limits itself to a tiny selection of them as it sets about proving that nature gave him detailed guidance on atmospheric effects and woodland textures, but it was the old masters who taught him composition and design. Constable’s determination to paint outdoors, to capture the presence of the clouds, the flatness of the fields, is presented here as part of a Europe-wide awakening of interest in the truthful observation of nature. In France, Valenciennes and Desportes were doing it. That excellent Welsh observer of Italy, Thomas Jones, was doing it. A fabulous sequence of tiny outdoor sketches, each no larger than a matchbox, apparently by Benjamin West, suggests even the Americans were doing it. However, when we come to Constable’s outdoor sketches, they too are initially plodding. A dull sky over Dedham Vale. A fidgety cart falling apart pictorially as it rattles down the road to Flatford. Constable was as weak at recording nature, at first, as he was at matching the old masters. I had almost given up hope of this show ever becoming properly stirring when, abruptly, it does. Amazingly, it is The Hay Wain, of all pictures, that wakes up the proceedings. Something else he must have learnt from Rubens was the value of working all this out in a large oil sketch. The V&A, which owns the most important examples, has recently had them cleaned. Seeing them here, hanging next to the images they preceded, is a revelation. The full-size oil sketch of The Hay Wain is such a lively thing: so bustling, brave and fidgety. But its task is to make fully obvious how much rehearsal, tuition, preparation, concentration and going of the extra mile went into achieving the famous outdoor spontaneity of Constable. Most of his important later works loom up now in the show: The Cornfield, that quintessential country lane down which all of us have wandered; The Leaping Horse, with its strange canalside sightlines of nature changing levels; the great view of Salisbury Cathedral from the Meadows, in which Constable throws the kitchen sink at us with every single effect he has learnt from his predecessors: the framing trees, the interesting foreground with a horse and cart, the dagger of water plunging deep into the picture, the dramatic church spire on the horizon, the brooding, thundery skies. He’s even added a rainbow to go totally over the top. The final rooms of this superior selection offer landscape theatre of the highest English calibre. The show’s revisionist message — that Constable learnt as much from the old masters as he did from nature — is unarguably and valuably made. Bravo, V&A. 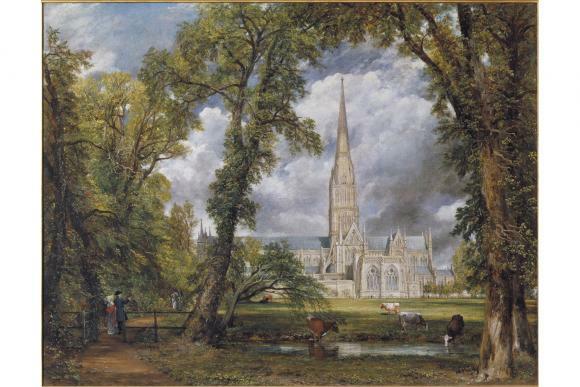 Another of Constable’s favourite Rubens paintings, the origin of that rainbow over Salisbury, is the Landscape with a Rainbow in the Wallace Collection. It’s a glorious piece of landscape art in which the clamberings and skippings of the paintwork seem to have been learnt from the growth patterns of a bramble bush. Now it’s on show again at the Wallace in the Great Gallery, which has finally reopened after a particularly ambitious rebuild. They took the roof off. They opened up some windows in the ceiling. They commissioned an acreage of gorgeous red damask. They managed somehow to make the space appear twice as big. All this works. I’m less sure about the hang. The finest Wallace pictures are here — the Rembrandts, the Van Dycks, the Velazquezes and, of course, Frans Hals’s Laughing Cavalier — but instead of grouping them according to national schools or matching genres, the Wallace has scattered them about the new gallery by following a pattern of tenuous connections. Thus, Lawrence’s posh portrait of George IV, from 1822, is hanging next to Van Dyck’s moody self-portrait as the shepherd Paris, from c1628, solely because Sir Richard Wallace intended once to give the picture to George IV, then changed his mind when the king predeceased him. Is that really a good enough reason to disrupt chronology this much? I thought the pictures also looked overcrowded in a busy two-tier hang. Fewer connections, better spacing would be my doctor’s orders.